Skyy Hadley, owner of As U Wish Salon, has these quick and easy tips to keep your manicure lasting longer during this extended heat wave! Remove your polish and let your nails breathe for a good few days. If nails look discolored, squeeze some lemon into your lotion or rub a lemon wedge directly onto the nail to brighten nails. Apply a shea butter lotion or non-greasy cream to lock in moisture. Begin painting! Apply a cuticle oil (see below) to the base of your nails (or even when they are already polished), focusing around the cuticle area to hydrate and bring moisture into the skin, helping the polish last longer. 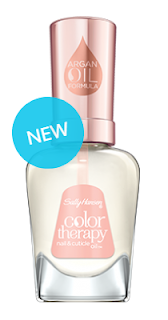 Finish off your manicure with Color Therapy nail & cuticle oil, formulated with breakthrough argan oil formula. Your ultimate in nail therapy.